Pamplin Media Group - Klaxoon: Honk if you love working. Klaxoon: Honk if you love working. The Monday meeting is an American software industry institution, but Klaxoon wants to change that. Klaxoon, a software company from Rennes, France, with offices in Brooklyn, New York, is trying to solve the problem of inefficient meetings. These are meetings that are either too long or too fragmented to be useful. The company claims the average American executive has two to three meetings a day and will spend 16 years in meetings over a course of a career. Since many meetings have devolved into individual laptop sessions, Klaxoon has come up with a way to incorporate all screens. Attention need no longer be on a white board or projection screen, it can now be on the participant's personal phone or computer screen. Launched in 2015 the company has over 1 million users using Klaxoon daily in 120 countries. Clients include Air France, Disneyland, L'Oréal, Accenture, Nestlé, Sealed Air, Verizon and Marriott. Their study of their own user base showed that 67 percent of people wanted to interact more, that is have more meetings. But the pain points were lack of participation (not listening or unable to express themselves), lack of decision making (only one-in-four end with a decision being made) and they are too long (on average in the U.S. meetings are 90 minutes). Klaxoon means "horn" in French and is supposed to represent a disruption, as in a complete change in the way things are traditionally done in business. Klaxoon is currently on a 16-city "Teamwork Tour." It started in January in Las Vegas at CES and ends in March at South By Southwest. The tour bus reached Portland was was parked in the lot next to Veterans Memorial Coliseum last Monday. On their software platform they call the tour Project Jack, in honor of Jack Kerouac, author of "On the Road". (There is no Project Dean.) The team does workshops on the way "to bring the meeting revolution." The Klaxoon team is traveling in a pink tour bus. Accompanying them is a pink 18-wheeler, inside whose windowless container space is a basic office set up, with touch screen monitors, stools and couches and a coffee bar. Because wifi is often unrealiable, for demonstration purposes the company built the Klaxoon Box which lets people connect wirelessly with no Internet or cell connection. They demonstrated this in the Mojave desert, standing around in the dirt, working. Other people have used this hotspot on construction sites where the workers go over safety rules. On a large screen they showed an example with the new version of the software called Klaxoon3. This one was categorized as a Brainstorm. It represented the weekly meeting of 13 Klaxoon staff, five of them attending remotely. The Brainstorm represents a month. It is called "The Voice" because that is the name of the Klaxoon marketing department. They are organizing and staffing the Project Jack road show and its attendant meetings. The goal of Klaxoon3 is to corral the mass of information that sprawls across file formats and times zones and make them into a usable document for a sit-down meeting. 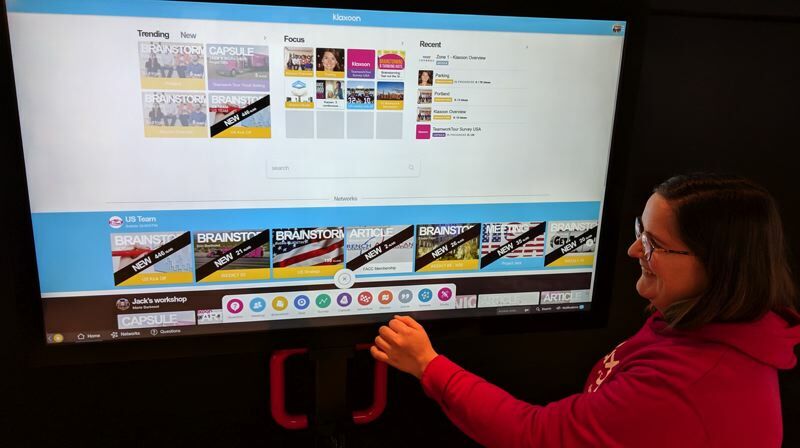 The interface is less passive than a PowerPoint presentation, less invasive than a video conference and less confusing than a conference call. It's more like a whiteboarding session where everyone grabs a colored pen but no one writes over each other's stuff. The Brainstorm is broken down into so many compartments that it looks like a month-at-a-glance calendar. Each column is topped with the headshot of a team member. Below are their comments, color-coded in the characteristic hues of Post-It notes: yellow, pink, blue and green. This is no accident since much brainstorming in creative companies is done using real paper Post-It notes. "That way they connect before the weekly meeting, and when people are talking they have a focused idea of what they need to talk about." Each person prepares by writing up their goals and latest news: what they have worked on and what they will be working on for the coming week. Klaxoon claims people pay more attention to other people's ideas when they can visualize them. Seeing them moved around on a screen into some sort of order also makes them stick. Many offices are multinational now, or at least multi time zone, so Klaxoon tries to solve the problem of asynchronous communication. Dropping emails in the night is better than calling or texting someone and waking them up for an immediate response. But email suffers from its polymer format, often ending up with long chains of nested comments that are hard to follow. So Klaxoon recently introduced a new activity called Questions, which are polls and quizzes. Research has shown that if people are asked to recall new information within a day it sticks in the memory for a long time. It was to make it easier to ask questions between meetings. "The idea is to let you rediscover the power of questioning," explained team member John Bloom. "Asking questions is at the heart of collective intelligence. Any time you need to collaborate you have to ask questions. If you do not, you will not innovate. When we answer questions we are engaging ourselves, we're mobilizing our expertise, and we're boosting our creativity within the team." There are four kinds of question. Open ended (a simple question), Vote (or poll or a chance to rate something out of five stars), Challenge (a quiz) and Storm (a word cloud). He says "A challenge is good for waking people up and testing their knowledge. They compete to see who can get the right answer first. If you offer a prize people get really excited." He has clients who are based in Paris but have team members in Singapore. They don't want to interrupt their sleep in Asia so they leave questions waiting for them when they wake up. "If you can reduce the number of face-to-face meetings with Tokyo that's probably better for everyone. Pricing, as with many SaaS products, is a moving target. The starting price is $19 per person a month. With volume the pricing goes down. A team of up to 10 includes two premium accounts, people who can answer questions for the other users. If someone is invited they can sit in on meetings for free, and move notes around on a screen, but not create new projects such as brainstorms. Julie David explained how the trucking company's main concern was finding a good parking lot to spend the night. A Klaxoon worker in France found parking lots, such as the one next to Memorial Coliseum, and shared them with the truck driver. This was just one layer of the road trip. "We are working together to find the parking lots," said David. "I gather all the information and I put it here, but he can follow up also on the Brainstorm, because I share my code." Many companies are struggling with how to work in teams, especially keeping them productive while letting them work remotely. 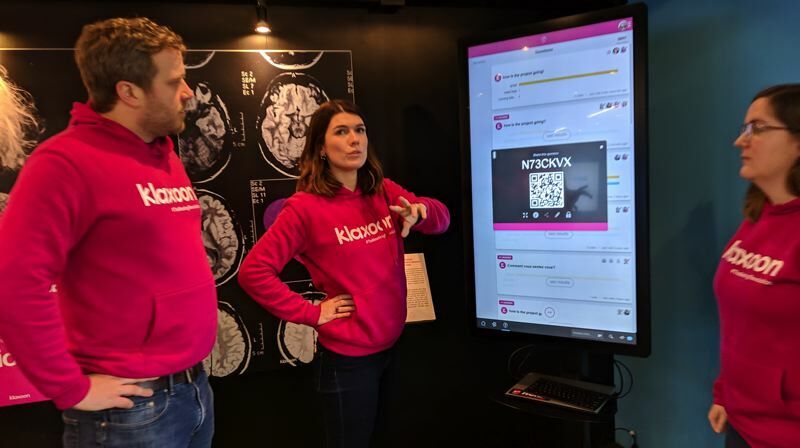 As white collar work evolves to become an almost seamless blend of screens, logons and meetings, Klaxoon is attempting to bring some order to it all.